Vice President Faisal Naseem tonight met with the council members of Villingili Island of Northern Huvadhu Atoll as part of visiting islands of Huvadhu Atoll. During the meeting, the members of the Council briefed the Vice President on the administration of the Council and informed the Vice President on the challenges faced in carrying out the work of the Council. 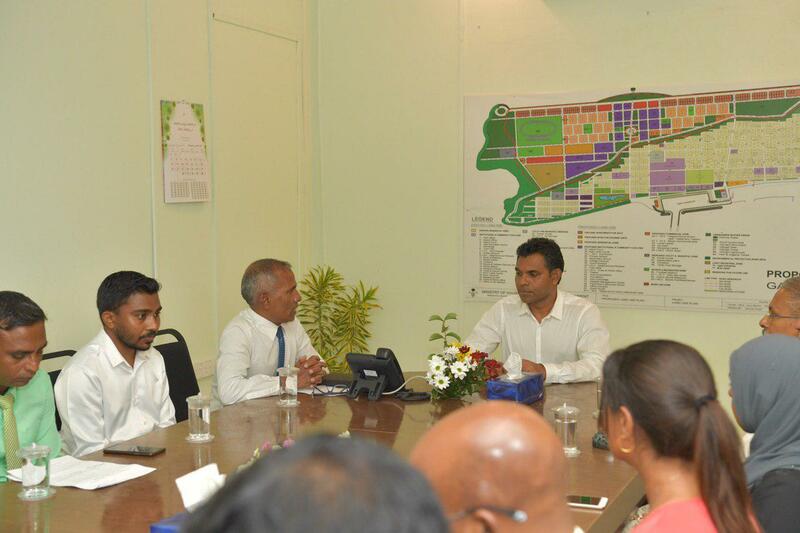 Moreover, they briefed the Vice President on the aspirations and requests of the people of Villingili Island in developing the community. The Council members emphasized that their top concern is Transportation. They noted that they are in need of an airport and developing the harbor. They also noted the electricity problems faced by the community of the island. Speaking more in this regard, the council member highlighted that due to lack of sanitation services at the relocated area people were facing difficulties. Additionally, they discussed about social issues faced by the Island’s community. Speaking at the meeting Vice President Faisal stated the government would take necessary action after discussing with the line ministries and tackle these problems.